Can Your Most Embarrassing Moment Top This? There they sat in stunned silence, jaws dropped, staring at me! The first brave guy started and recounted his story as people giggled and laughed throughout. "Now, that wasn't so bad" seemed to be what the guests were feeling as they became more comfortable. The next lady began her tale, turning red with embarrassment, which made her story even more funny! In succession, person after person shared a memory from days past, each proudly smiling at the end as the new friends joined in their laughter. Then, lastly, it was my turn. Like the rest, I shared my most embarrassing moment. When finished, no one laughed; rather, they stared at me in stunned silence, seeming a little embarrassed themselves! "That's o-d-d," I thought to myself. After some noticeably awkward silence, the leader cleared his throat and continued, "Umm,â€¦okayâ€¦quite a colorful embarrassing moment indeed! Ummâ€¦moving on . . ."
While this true account may not have fit in well in that setting, this has become a favorite story among my friends and relatives. People tell me my story does fit right up there with other outrageous stories written with outrageous openness, but you decide. 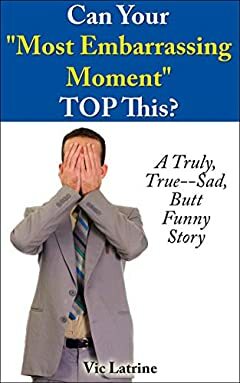 You may find it a shocking true story like some of my close family members, or maybe it's just another shameless Kindle book only liked by crazy people.